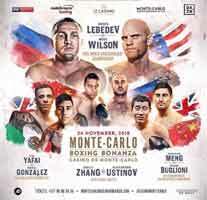 Review by AllTheBestFights.com: 2018-11-24, some good exchanges between Denis Lebedev and Mike Wilson but it is not enough to get three stars: it gets two. The former Ibf and Wba champion Denis Lebedev entered this fight with a professional boxing record of 31-2-0 (23 knockouts) and he is ranked as the No.5 cruiserweight in the world (currently the #1 in this division is Oleksandr Usyk). He lost to Murat Gassiev in 2016 (Denis Lebedev vs Murat Gassiev) but then he has beat Mark Flanagan (Denis Lebedev vs Mark Flanagan) and Hizni Altunkaya (Denis Lebedev vs Hizni Altunkaya). His opponent, the undefeated Mike Wilson, has a perfect record of 19-0-0 (8 knockouts) and he entered as the No.59 in the same weight class. In his last three bouts he has won over Ernest Reyna, Melvin Russell and Mario Aguilar. Lebedev vs Wilson is the main event of the evening. Watch the video and rate this fight!